If you’re a fan of exploitation movies on the other hand, especially horror, you are privy to a much different side of Canuck cinema. If not, that’s where Winnipeg native Caelum Vatnsdal’s They Came From Within would really be of assistance. The book has recently received a second edition, and I think it should be an essential piece of every Canadian film lover’s library. Vatnsdal takes readers all the way from cinema’s infancy in the 1910s to movies that have just come out this year for a grand overview of Canadian horror, which he refers to amusingly throughout as “Tundra Terror”. Far from a dry academic treatise, the book instead has a slightly snarky tone, like the patter you’d get from a video store owner who’s seen it all, but isn’t jaded. Vatnsdal is to my mind appropriately reverent towards horror movies that deserve close attention, like the early works of David Cronenberg, the Cape Breton slasher film My Bloody Valentine, the Ginger Snaps trilogy, and the amazingly intriguing Rituals (which I’ve not seen, but now I really want to), which reads as a Canadian equivalent to Deliverance. When faced with a bad movie though, like Things, or the later entries in the Prom Night series, Vatsndal pulls no punches with his commentary, delivering hilarious takedowns. There’s also a helpful guide at the back of the book, featuring cast lists and synopses of all the movies referenced in the text. I’m going to be referring to this often in the future as I bulk up my own knowledge in this area. The bulk of the book takes place during the “Tax Shelter Years” of the late ’70s and early ’80s, when financial incentives drove production of hundreds of horror films in the Great White North. These ranged from knockoffs of popular U.S. fare to completely bonkers passion projects, and it’s a lot of fun to read about the shoe-string budgets and directorial crises faced by a lot of these movies. Less so is the decline of Canadian horror in the late ’80s and early ’90s, but the new version of the book ends on a hopeful note with filmmakers like Jason Eisener (Hobo With a Shotgun), the Soska sisters (American Mary) and the Astron-6 collective (Father’s Day, The Editor) reclaiming Canada’s blood-soaked and economically-priced horror legacy. While I would have liked Vatnsdal to go into a little bit more detail about what themes differentiate Canadian flicks from other countries, I feel like that kind of editorializing might not have fit into the scope of the project. 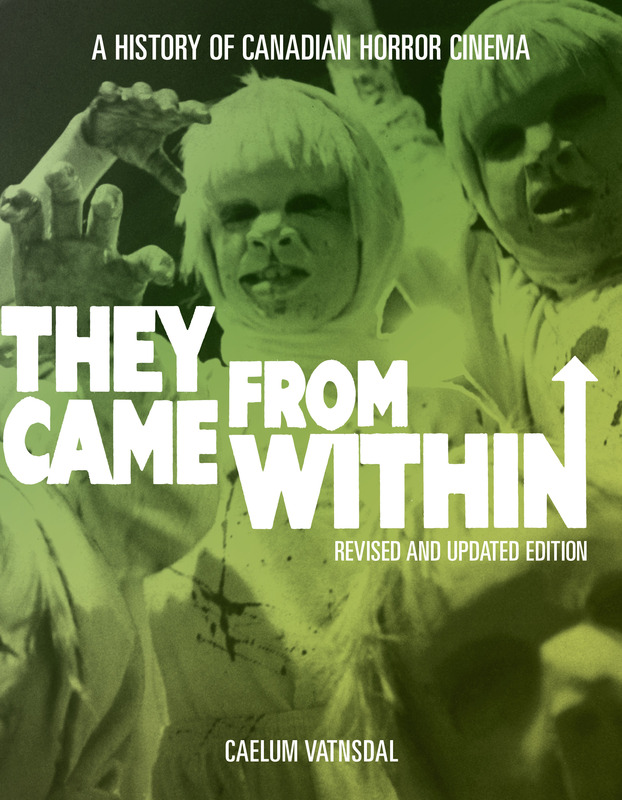 With his new edition of They Came From Within, Caelum Vatnsdal has done a great job of putting the entirety of Canadian horror film production back on display, in all its gory glory. With a snarky sense of humour and an encyclopedic memory, Vatnsdal has made a highly readable and highly valuable contribution to this country’s library of film criticism. Highly recommended. Previous PostFollowup Questions: An Interview with Ian Weir, author of Will Starling! Next PostFollowup Questions: An Interview with Caelum Vatnsdal, author of They Came From Within!